Design Features - PolyTech Products Ltd.
PolyTech windows are manufactured in Nova Scotia using top-of-the-line PVC vinyl, reinforced with galvanized steel (as required). Our frame and sash corners are mitre cut and fusion welded to provide superior strength. The sash and frame are double weather-stripped, with compression seals and a multi-point locking system all around the sash opening for maximum protection against the outside elements. PolyTech windows can give you Peace of Mind, with the highest test results for air infiltration A3, water leakage B7, and wind load pressure C5. 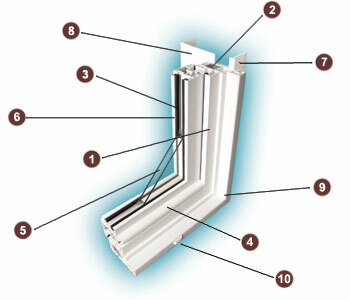 European Designed Tilt-and-Turn Window Technology has been widely used for many decades. This unique design allows you to tilt the window in from the top, eliminating direct drafts at lower levels and providing you with a comfortable exchange of air. The stale warm air exits at the top and the cooler fresh air enters around the sides. The inward turn function of the window allows for easy cleaning or fire exit. 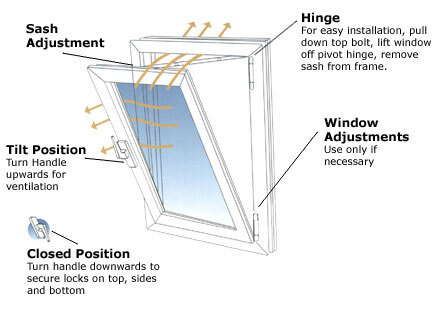 The Tilt-and-Turn style of windows open in at the top for ventilation (tilt), and also open at the side like a door (turn), for maximum cleaning, ventilation, or in case of fire, quick and easy escape exit (egress). All these operations are performed by one handle for your complete convenience. Heavy 3ml vinyl frame and sash to provide long-lasting and maintenance-free window. Frame is 4 inches wide for added strength and durability. Galvanized steel reinforcements in sash and frame in most window sizes to provide optimum strength. Dual bubble-type rubber weather sealing for complete air and water tightness. Vinyl water nosing to deflect water over frame when window is in tilt position. Standard 4ml double-glazed glass with 16ml (5/8") air space. (Low E, argon gas, decorative glass available on request). Snap-in vinyl glass stop with rubber seal makes for easy glass replacement. Comes complete with nailing flange for easy and secure installation. Interior vinyl trim available for new or replacement. Fusion-welded sash and frame corners to provide strength and prevent water leakage. Each Polytech window is custom-manufactured so it fits right the first time. Every window is designed to meet our incredibly strict requirements before bearing the PolyTech name. Our windows are subject to testing that simulates 100 years of operation. Our millwork is constantly checked for craftmanship as precise as .005 of an inch. PolyTech goes to painstaking lengths to craft handsome windows that enhance the look and comfort of your Home or Business.